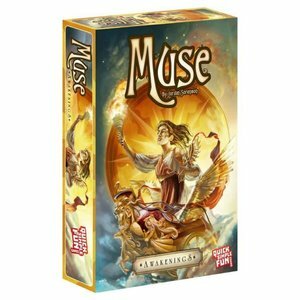 Muse: Awakenings is a standalone game that can be played as its own complete experience, or as an expansion to elevate the Muse base set to new heights! Lead your teammates to inspiration using cryptic clues and surreal imagery in Muse: Awakenings, a beautiful party game wiith 84 fresh Masterpiece cards, 22 all new Inspiration cards, and an improved scoring system that that offers bigger rewards for attempting more difficult clues. Challenge your creativity and inspiration, listen closely to the fire burning deep within, and let your Muse guide you to your Masterpiece!